For a movie based on an amusement park ride, Pirates of the Caribbean: The Curse of the Black Pearl is a pleasant surprise. I’m sure some people might have realized its potential, with Gore Verbinski behind the wheel. His moody and atmospheric horror film The Ring was quite terrifying, and I slightly preferred it to the original J-horror Ringu (though I will admit I saw The Ring first, which may have clouded my judgment). This is also the man who made Mousehunt, so some of the awkward one-liners and goofy action scenes are to be expected. The story is complicated, especially for a movie based on a ride. The plot of Curse of the Black Pearl, however, pales in comparison to the ridiculous complexity of the two sequels, Pirates of the Caribbean: Dead Man’s Chest and Pirates of the Caribbean: At World’s End. At least there are some strong characters to guide the audience through the confusion. Johnny Depp plays Captain Jack Sparrow, a famous pirate in the Caribbean seas. His past is mysterious, though one suspects it might hold clues to his odd behavior and nervous tics. He arrives at Port Royal in time to rescue the governor’s daughter, Elizabeth Swann (Keira Knightley), from an unfortunate plunge into the ocean. She is burdened by the pressures of English society (including corsets) but longs for a normal life and a relationship with the blacksmith’s apprentice, Will Turner (Orlando Bloom). But after his semi-heroic rescue, Captain Jack is captured and sentenced to death, as an unfortunate consequence of his being a pirate. An incident occurs, however, to delay his inevitable hanging. A pirate ship cruises into the port one night, bombarding the city and making off with Ms. Swann and her gold doubloon necklace. After Commodore Norrington (Jack Davenport), the military leader of the island, refuses to go after them swiftly enough, Will decides it is his duty to track down Elizabeth. He breaks Captain Jack out of jail and together they sail after the Black Pearl, the most feared ship in the Spanish Main. 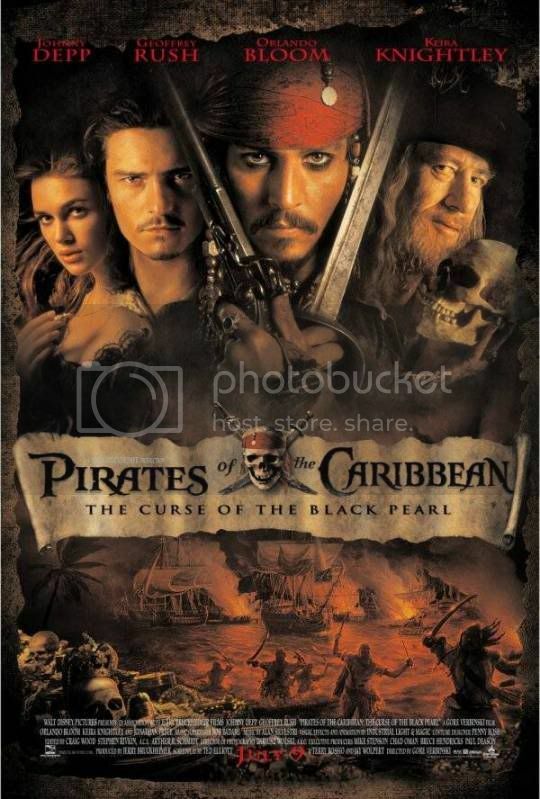 Its captain, Barbossa (Geoffrey Rush), is a dreaded pirate, and there is talk of a deadly curse that has befallen the crew. The adventure leads them to strange places filled with odd characters. Along the way there is plenty of swashbuckling, sword fights, sea battles, ghostly skeletons, and a delightfully wicked monkey. The whole movie is just plain fun, and that’s all it strives to be. The characters are well defined and memorable, and their shifting morality and allegiance adds a fun dimension to the proceedings. Johnny Depp is outstanding, blending in perfectly to the period while giving a hilarious performance. Geoffrey Rush eats up the scenery like an apple, relishing his role as a rogue captain. There is silliness and goofiness, and some of the one-liners fall a bit flat, but overall the experience works wonderfully. The special effects are perfectly adequate, and Verbinski’s nose for atmosphere serves the film well. The mise-en-scène is remarkable, with colorful and detailed set decorations. The film most reminds me of The Princess Bride; a grand adventure with great characters and a romantic angle, with expert sword fighting and a convoluted plot. While Pirates of the Caribbean: The Curse of the Black Pearl does not attain the standard set by The Princess Bride, it is the closest effort the 21st century has yet produced. This entry was posted in 3.5 pirate flags, 3.5 stars, Movie Reviews, P on January 20, 2010 by Tim Irwin.